It had been over 44 years since the end of the Valbanill War, in which time the land had recovered and the three independent Trade Cities had risen. However, a legacy of that awful war still remains – in the form of Demon Contracts, a weapon which transforms desperate humans into virtually unstoppable demons. Cecily Campbell, a young Knight Guardian with little experience with a sword, finds herself taking up the honored mantle when her father dies. However, her first battle saw her family's heirloom sword destroyed. But during that same battle, she meet Luke Ainsworth, a moody blacksmith whose katana is able to slice through the hardest of swords. Cecily tries to implore him to craft her a new sword, but Luke feels that she's not worthy of such. 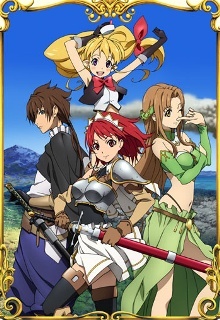 It is then that she is chosen by her fellow Knight Guardians to protect a great treasure – a Demon Sword named Aria. What follows is an adventure she's never dreamed of.